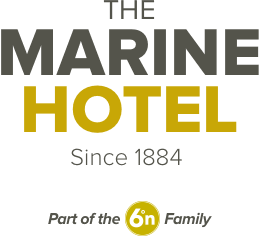 The Marine Hotel in Stonehaven, is a popular harbour hotel offering bar, lounge, restaurant and rooms with stunning views over Stonehaven harbour. Only 20 minutes from Aberdeen the Marine is a popular destinations for local Stonehaven residents, tourists and the wider community of Aberdeen and Shire. The food is superb quality specialising in using local ingredients and as you would expect, the local fish is first class.